1. Preheat the oven to 180ºC, gas mark 4. Heat the oil in a large ovenproof casserole dish, add the onions and fry over a medium heat for about 5 minutes or until softened and lightly browned. 2. Add the casserole vegetables and cook for another 5-8 minutes or until slightly softened. Stir in the tomato purée and cook for 1 minute. 3. Place the beef in a large bowl and season with freshly ground black pepper. Add the flour and toss to coat. Add the beef to the pan with the vegetables and stir well. 5. Stir in the redcurrant jelly and remove the rosemary sprigs. Serve the stew with the steamed green vegetables and boiled new potatoes. A meat stew is the type of dish that can easily be prepared ahead of time. Make the day before and leave overnight in the fridge for the flavours to develop. Alternatively, make a double batch and freeze half for dinner one night next week. 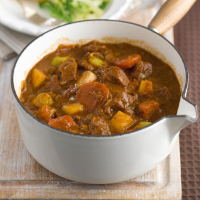 To transform your beef & ale stew into beef bourguignon, swap the ale for 250ml red wine and 250ml water. Add 250g closed cup chestnut mushrooms (whole) for the last 30 minutes of cooking.